Olivia Wilde stars in the new movie, "The Lazarus Effect," about a serum that revives the dead. Fairfield Citizen film critic Susan Granger reviews the new movie, "The Lazarus Effect:"
In a Berkeley, Calif., science laboratory, medical researcher Frank (Mark Duplass), his fiancee Zoe (Olivia Wilde) and their cohorts make a remarkable discovery: By injecting a psychedelic chemical called DMT into the part of the brain called the amygdala, they can revive the dead. They call it the Lazarus serum. After a successful but unsanctioned experiment on a lifeless dog, they're ready to make their work public -- even though the revitalized canine exhibits some bizarre behavior. Filled with Catholic guilt, conscience-stricken Zoe asks: "What if we ripped him out of doggie heaven?" Not surprisingly, when the authorities find out about what they've done, the lab is closed. And in an attempt to recreate the experiment, Zoe is electrocuted, which propels grief-stricken Frank to test the process on her. While Zoe appears to be resuscitated, something vengeful and evil has grown within her. Now a zombie, she's capable of telekinesis, telepathy and a disconcerting predilection to dilate her pupils. Riffing on the Frankenstein myth, the cliche-riddled screenplay by Luke Dawson and Jeremy Slater recycles science, religion and horror, touching on the various moral issues involved before dissolving into predictable violence. Olivia Wilde is remarkably good, whether she's reciting techno-babble or going bonkers, stalwartly supported by Mark Duplass, along with Donald Glover, Evan Peters and Sarah Bolger. What's surprising is that director David Gelb chose this weird, low-budget project after the success of his foodie documentary "Jiro Dreams of Sushi," profiling Japan's greatest sushi chef. But Gelb utilizes far too many "jump scares" in which something off-screen darts at someone, accompanied by a loud noise. FYI: If you look at Olivia Wilde's eyelid in the poster, you can discern "John 11" on her veins, referring to the Biblical resurrection of Lazarus by Jesus, as related in the Gospel of John. And if this creepy concept intrigues you, consider the far-better "Flatliners" (1990), starring Julia Roberts, Kevin Bacon and Kiefer Sutherland. 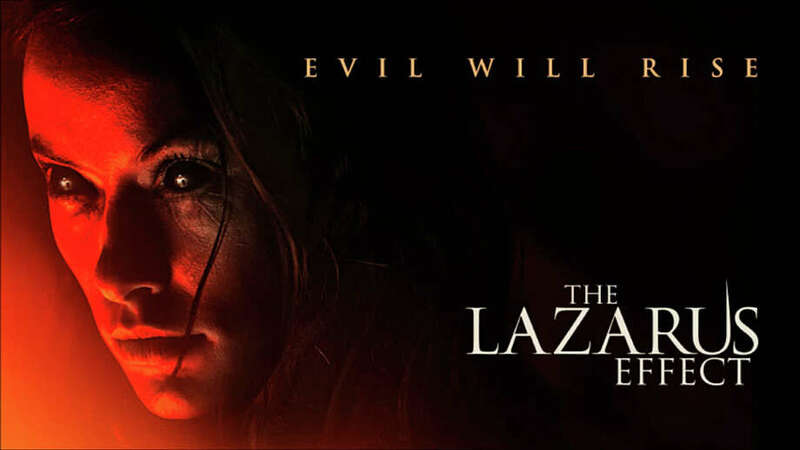 On the Granger Movie Gauge of 1 to 10, "The Lazarus Effect" is a faltering 4, as the fright ultimately fizzles.